For anyone who hates carrying luggage, help may be on the way. A California company has launched an Indiegogo campaign for an autonomous suitcase that it says will dutifully follow you. There's no need to grab its handle and drag it along. The suitcase stays three to five feet behind a person by tracking the location of their smartphone. It moves either upright, or while laying on its side. "Suitcases haven't really changed for the past couple of decades. It's overdue for innovation," said David Near, the CEO of Travelmate Robotics. Near envisions the suitcase as being useful for pretty much anyone -- from businesspeople to tourists to the disabled. The Travelmate comes in three sizes, selling for $399, $495 and $595. It tops out at 6.75 mph. "For a lot of things, having an autonomous suitcase is much more comfortable," said Near, 61, who decided a year ago that it would be cool to have a "robot companion" as he traveled the world. The suitcase has been tested successfully in shopping malls and sidewalks, according to Near. He's not concerned about the suitcase bumping into something in a crowded airport or train station. The prototype suitcase relies on an infrared sensor to detect and avoid objects. But the final version, which ships next year, is expected to have a different sensor, perhaps a camera or radar. So far, Near's project has raised only about 3% of its $100,000 goal on Indiegogo. If fundraising doesn't pick up, he will seek funding from traditional investors, and still plan to make deliveries next summer. Excited travelers should probably temper their enthusiasm. The suitcase is only a prototype, and how it sees and avoids objects isn't finalized. 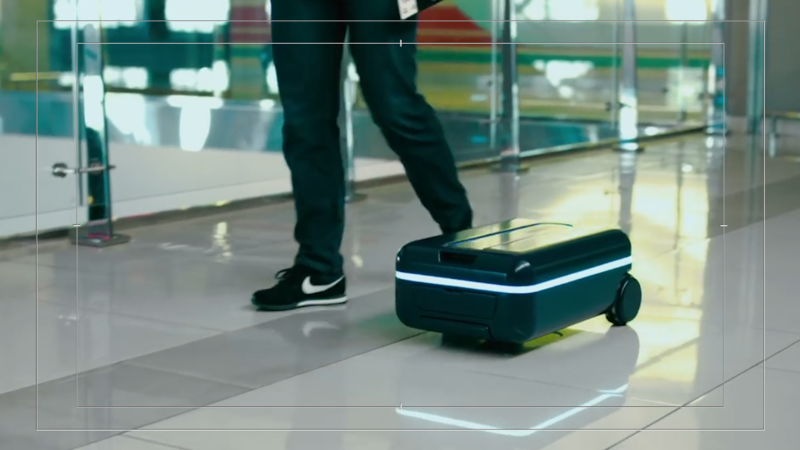 While the company's video of the suitcase in action appears impressive, the suitcase will have to prove itself in crowded, real-world airports. Another question mark is the risk of theft. If the suitcase is more than 15 feet from its owner's smartphone, an alarm will sound on the suitcase. There will also be an alert sent to the person's smartphone. The company is developing a workaround so the alarm won't go off in situations when it's normal to be separated from your bag, like checking a bag at an airport.